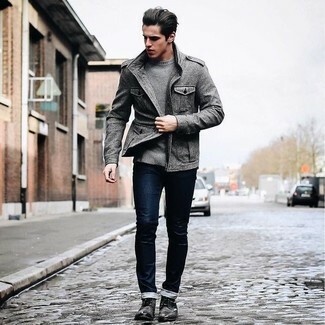 Go for a pared down but at the same time casual and cool option by pairing a grey military jacket and navy skinny jeans. Ramp up your look by rounding off with brown leather derby shoes. 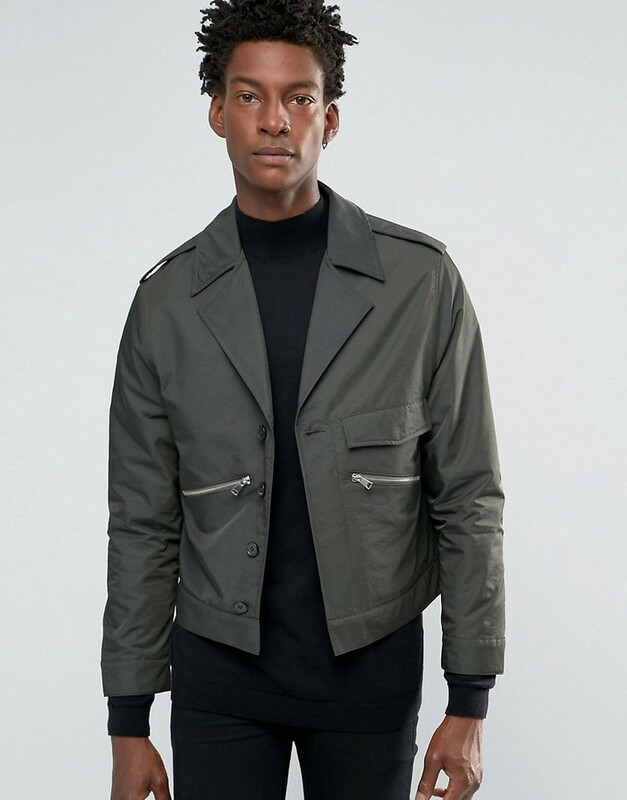 If you're on a mission for a casual yet sharp ensemble, consider pairing an Asos smart military jacket in khaki satin with navy skinny jeans. Both garments are totally comfortable and will look great paired together. Up the cool of your look by wearing black leather derby shoes. 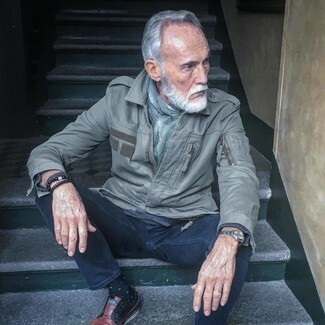 If you're facing a fashion situation where comfort is prized, consider pairing an Asos smart military jacket in khaki satin with khaki chinos. 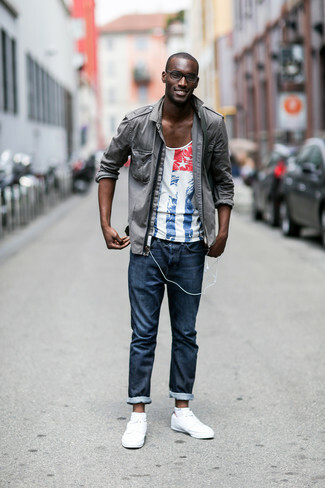 When it comes to footwear, this ensemble is complemented wonderfully with red leather brogues. 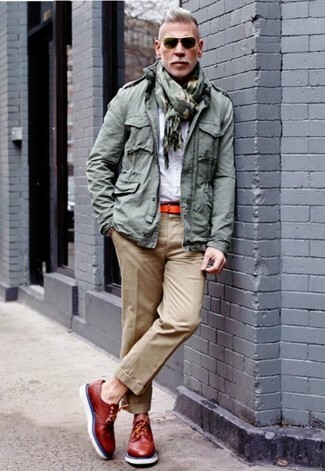 If you're after a casual yet stylish outfit, wear an Asos smart military jacket in khaki satin with navy chinos. Both items are totally comfortable and will look great paired together. 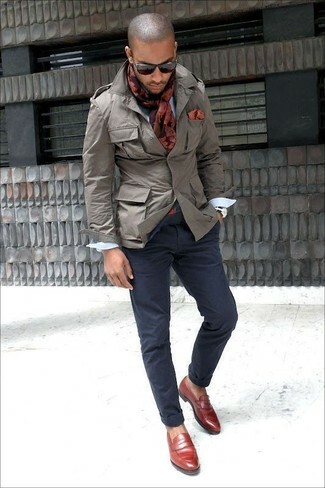 When it comes to footwear, this look is round off wonderfully with burgundy leather loafers. 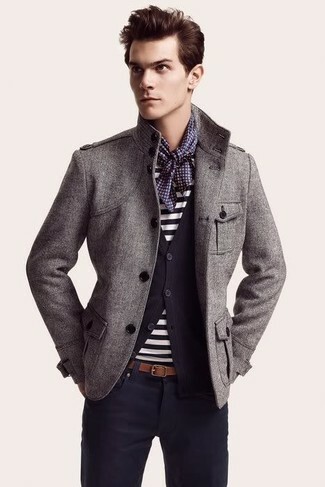 If you're scouting for a casual yet sharp ensemble, pair a grey military jacket with navy chinos. Both pieces are totally comfortable and will look great paired together. 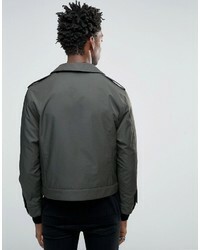 If you're scouting for a casual yet sharp outfit, pair an Asos smart military jacket in khaki satin with beige chinos. Both items are totally comfortable and will look great paired together. A pair of dark brown leather casual boots will integrate smoothly within a variety of ensembles. 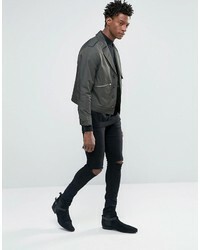 If you're scouting for a casual yet dapper getup, wear an Asos smart military jacket in khaki satin from Asos and grey skinny jeans. Both garments are totally comfortable and will look great paired together. Grey low top sneakers are an easy pick here. 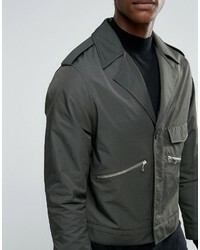 If you're on the hunt for a casual yet sharp ensemble, rock an Asos smart military jacket in khaki satin with navy jeans. Both items are totally comfortable and will look great together. 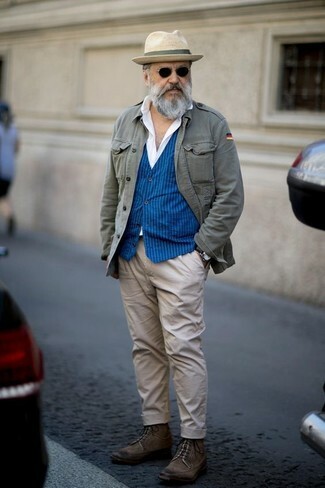 For something more on the daring side to complete this outfit, rock a pair of white leather low top sneakers.